A few weeks ago I was all set to make a set of mini-loaves of one my new fave recipes - Joy of Cooking's Pumpkin Bread - to give as gifts. I had borrowed my sister's set of loaf crocks she had magically found for $1 each at Michaels a couple years ago. I had the ingredients. I had the the time on a Sunday morning. And then I got my new issue of Martha Stewart Living in the mail. The last page detailed a recipe for Blueberry Lemon Tea Bread. How apropos for the summer season, I can't say I would equate my pumpkin bread with mid-June and 80 degree heat. I switched gears quickly and picked up a handful of lemons and a pint of blueberries. Everything else was easily on hand, don't you love those kind of recipes? Now here's the tricky part. We do not have a microwave at our temporary home, so how to melt the butter enough to be able to mix it in with the sugar and egg? Why not set it on the stovetop as the oven heats up to 350? I also needed to make sure it was malleable enough to mix by hand - the KitchenAid Stand Mixer and even my electric hand mixer are staying packed up. Time to fold in those blueberries. Divided up into 6 individual crocks, I fit them all on a cookie sheet for stability and threw them in the oven. Half an hour later they came out with golden edges. A new staple? Clear plastic gift bags from Michaels (or any craft store I'm sure). Wrapping the breads tightly in saran wrap helps them stay fresh, but the bag adds a little extra flair to the gift-giving process. Tie some ribbon around it with a homemade tag - future idea: add a link to the recipe right to the tag! This photo spread was actually the second batch I have made this month - had to take advantage of a supermarket sale on blueberries: 2 pints for $6! I brought these guys up to a family vacation in Wisconsin Dells to enjoy in the hotel suite for early breakfasts and they did not dissapoint. After a seven month lull, I finally updated the links on the pages of this blog! Sadly, it did not go too slowly considering I have not been much of a posting fiend the last few months, but alas. Hows about a trip down memory lane with a few projects? Another recipe I have made more than a few times over the last year and a half is a crockpot meatball/spaghetti sauce. The best part of this recipe is that with a small crockpot I can only fit half of the meatballs so I freeze the rest. I have also found that the grocery store will only sell ginormous cans of tomato puree and crushed tomatoes so I use half of each and freeze the rest. This way, the next time I want to make the recipe all I need is a quick thaw in the fridge, 1 can tomato paste (not in the recipe, but I always add one to tomato based sauces to help thicken them up) and 1 jar spaghetti sauce. In honor of it being this same weekend, here's to StrawberryFest - a Long Grove tradition! Mmmm. . .donuts! It was also a little more than a year ago that I hit the road with 10 girlfriends bound for Nashville (road being figurative, we all flew there). A yee-haw, country-music kickin' three days followed. An early foray into DIY for me, check out these distressed picture frames which later hung in my Mom's made over kitchen. When it comes to decorating our next home, the presence of a library - even if it not held within its own four walls, but part of a larger room, is a neccesity. This was the first area of our last apartment that came together and for the two years we lived there was one of my favorite parts! The project that started the blog! My sister's baby shower proved that I take being crafty maybe a little too seriously, as demonstrated by the homemade invites I took on, but it was oh so much fun. And now with baby #2 on the way, the fun in the family continues! Putting the crafting to good use, I have started packaging up sets of cards to give as gifts. Check out how they turn out here. 2 years after first moving in together, Bob and I haven't killed each other yet. I think part of the reason is our organization when it comes to our joint finances. Read about how we break things down (and make some money doing it). Finally, adding links related to my goals from last year got me thinking to my next set of goals that are a few months overdue - stay tuned for a post soon to see what I have in store for this next year! 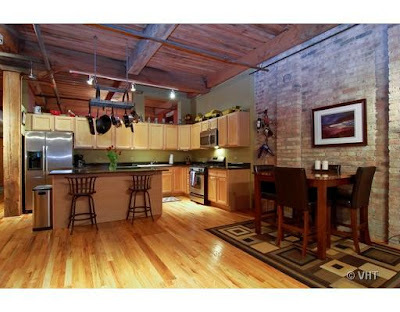 As mentioned, we've taken a big step in making an offer on a condo! While waiting for the bank to (fingers-crossed) approve the short sale, I am definitely having fun thinking about all we can do with this in our hands. Starting the search months ago, I came into this project thinking I would have very specific likes and dislikes. 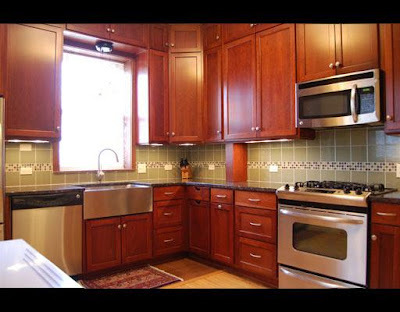 New construction and granite countertops good. . .vintage bad. Large balcony good. . .no outdoor space at all bad. Laundry in unit good. . .laundry not in unit is not even an option. I surprised myself along the way by realizing the cookie cutter 2 bed/2 bath new construction condos left something to be desired. We wanted something with a little more character (one of those words that is often used to describe older buildings). 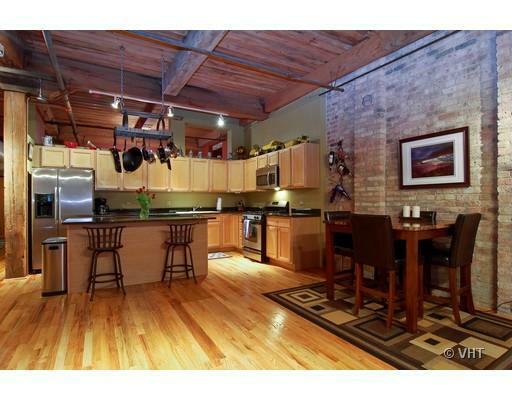 So when we first spied an amazing 3 bedroom that fit our price range a few months ago we thought we hit a home run. 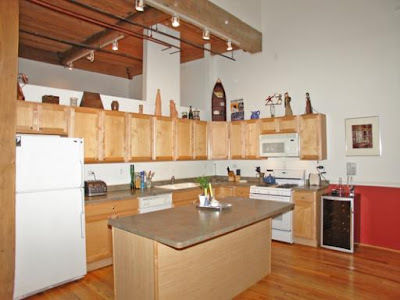 Great location, upgraded kitchen, seperate library and did I mention 3 bedrooms? We actually put in an introductory offer, but reality set in when we ran the numbers and the extremely high assessments couldn't be justified. The mortgage price and taxes were decent, but when the assessments add another 1/3 to that amount each month we could see that getting old very fast. 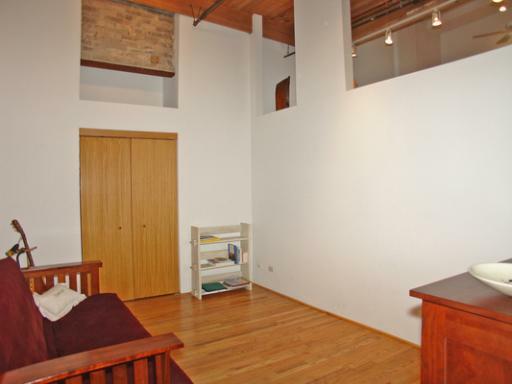 Last month we thought we nailed it once again: a foreclosure right in the heart of Lakeview, large 2 bedroom on the top floor. 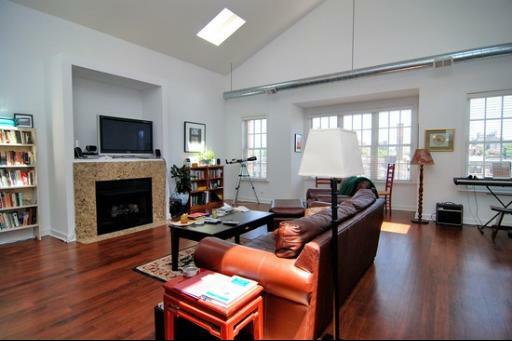 High ceilings with sun-drenching skylights. A living space that was at least 25'x20' which meant we could break it out into at least 5 separate areas (entryway leads into the media space and sofa, library/sitting area in a bump out near the windows, bookshelves seperate an office area and on the other side of that would be the dining room table before you found yourself back at the kitchen). However, getting that full story when it comes to foreclosures is always key. Insanely expensive taxes coupled with some dicey financials for the building quickly put this on the burn pile. Sigh. And then there was number three. I got a call from Bob when I was in Vegas the other week for work and he said, "you gotta see this place." The 3 bedroom from Scenario 1 was also found by him during an open house when I was on a work trip so I'm beginning to think there's a pattern here. . .
Close to Wrigley Field, but not so close we'd be living like those fresh out of college kids. Loft style building that started as a soap factory and transitioned to being a car dealership until it was made into condos about 13 years ago. Exposed brick, 20 foot ceilings and a lot of potential. We think we found the balance between move in ready and total fixer upper. Grant me the next few paragraphs and allow me to dream. . . Comparable to the great room we saw in that last foreclosure, there is plenty of space to break out the living space into a library/sitting area around the fireplace, media center and sofa on the opposite wall and a dining table closer to the kitchen. Disclosure: This photo is not from the unit we are looking at, but as it is the same layout I thought I would share a different angle that really hammers home the scale of the room. With a kitchen and 2 bathrooms along these lines, we can easily save some scratch and tackle one room each year or so. The Kitchen already has a massive island for food prep and ample cabinet space. An upgrade to appliances, the countertops, thrown in a backsplash and a stain on those cupboards might be all we need. There is plenty of usable space in both bathrooms. The idea we had was to create a linen closet or shelf system in the 2nd bathroom and expand out the tub and shower options in the master suite. 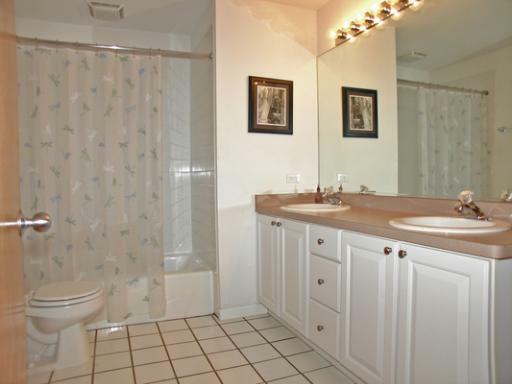 New tile and vanities could really spruce them up. The door to the master bath wastes alot of space when it swings opens the whole way so I would love to look into replacing it with a pocket door. Could be a fun project! 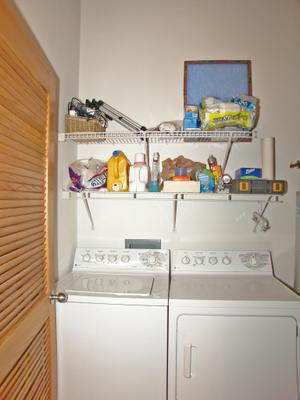 I loved when we would look at places and the in unit laundry wasn't just shoved in a closet, but included actual space to use around the washer and dryer. I like the idea of getting stackable units and putting shelving all the way up along the other side. This would also leave room on the other side of the floor for the cat litter - always a tricky thing to find a place for in a condo! Of course, one of the easiest things we can do is choose some paint colors! 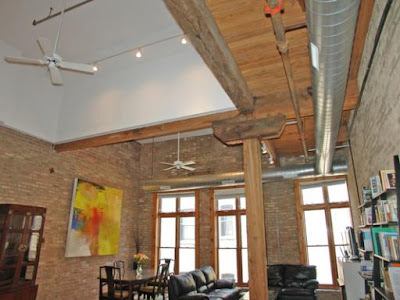 With 20 foot high ceilings, the logistics of painting could be interesting but challenge accepted. One of the benefits of saving some money by living in a one bedroom month to month now is that we could always juggle a month or two of mortgage and rent so that if we wanted to take the time before move in to paint and stain the floors we could do so without shifting around all of our stuff as soon as it found a home! You might be thinking to yourself, "But Lydia, didn't you say in a previous post that you were now committed to finding a 3 bedroom?" I struggled with that myself, but we resigned ourselves to the idea that our second bedroom does not have to be a bedroom first and foremost. We don't have guests all the time, so why not actually use the room ourselves? Plans are to set up the second bedroom - you can see the loft influence in that the walls at the top are exposed - as a workspace with our computer desk and a craft table I plan on making out of a couple bookshelves and the headboard from my disposed of IKEA bed. Guests of Lydia and Bob will live in the lap of luxury when we invest in one of those ultra-posh Aerobeds that blow up to just about the same size as a real bed. The master bedroom has a large walk in closet that was already decked out with an elfa set to give us ideas on how to best utilize the space. The room is brick on 3 sides - apparantly it was the car lift space from when the building was a dealership! 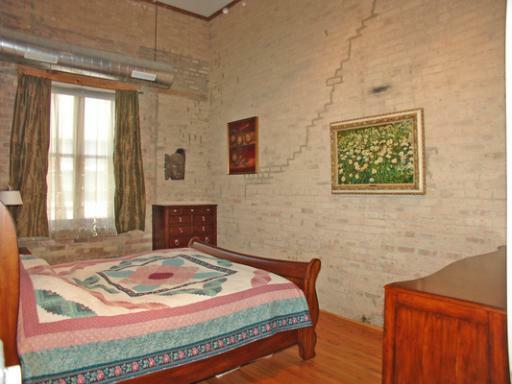 I like to think the thick brick will help insulate noise as I don't always love when bedrooms are right off of the main rooms and not down a hallway. Have you noticed which area I haven't covered? One deterrent is that there is no balcony. Pros and cons were weighed. How much did I really use the balcony other than to grill? Was I really going to take gardening so seriously that I would have filled the deck with veggies and flowers? Could we still grow a few things inside the house but against the windows to get them some sun? Could we store the grill in the garage and pull it out into the alley on rare occasions? All valid questions. In the end, it was not make or break for us. I might just have to invest in a really nice grill pan for the stovetop as I don't intend on ever eating hamburgers that don't have grill marks on them. So could this be the place for us? We'll hopefully know in the next month or two. In the meantime, we'll keep looking and stay on alert so we don't miss out on something else should this one fall through. . . .the wait continues. While 1/4 of our main living area is taken up with a stack of boxes and empty shelves, I have been trying to find small ways to make our temporary house a little more like a home amid our packed up lives. 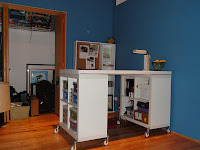 The bedroom only had space for one of our night stands (our twin beds pushed together, aka "super bed" is taking up its fair share of room), so I threw the other one in the hallway as a make-shift entryway table. Our tiny kitchen also has no room for the much needed junk drawer (only having one drawer and all), so the nightstand is also pulling double duty as the holder of lint brushes, extra batteries and tape. One thing I will give this place is its ample closet space! We filled two of them to the brim with stackable boxes and some lighter options on the top shelves. Same goes for the bedroom closets. The idea is to get some of our boxes out of the way so our dining room area doesn’t look quite so insane. Luckily, we found room against the bedroom wall next to the dresser for our beloved full length Mongstad Mirror from IKEA. What we didn’t do was reinforce the leaning monstrosity by screwing it into the wall as we had done at the last place. How to make sure the mirror doesn’t even think about sliding forward disastrously? Prop a storage ottoman stacked with heavy coffee table books against one of the corners! Classy. These little touches are helping me to ignore this elephant in the room! Good news getting better – we put an offer in on a place and have been approved by the seller. Since it is a short sale we just have to be patient as we wait for the bank decision! Fingers crossed that in a couple short months my posts will start to lean towards the “painting” and “refinishing floors” variety. May, I hardly knew you. In between a crazy month of work travel and conferences, Bob and I continued to search for a permanent home all the while packing for our temporary one. To save a few dollars this summer, we decided not to renew our lease on our 2 bedroom on June 1 and instead downsize to a one bedroom in a different neighborhood on a month to month lease until we close on a place of our own. To continue down the path of saving money, we decided not to get movers for this leg (though you better believe they will be booked come fall or whenever we end up moving again!). 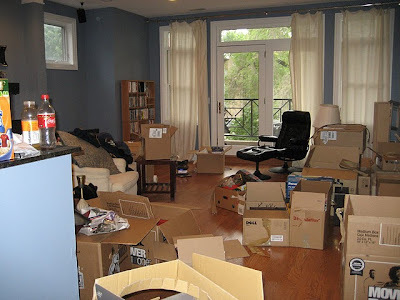 Since we had some flexibility in getting into our "new" apartment about a week ahead of June 1, we could take the long Memorial Weekend and knock it all out. 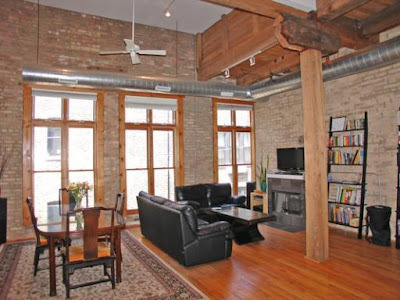 When we moved to Uptown, we knew renting was not going to be long term, 2 or 3 years at most. Therefore, we partially filled our storage unit with broken down moving boxes. No sense wasting some good product like these heavy duty Dell boxes from Bob's work! One of my conferences that happened to be in Chicago provided me with a few more good size boxes for books (not too big where you can't even lift them). Every night I just brought a few more home with me on the bus. Bob did a run to Binny's, a local liquor warehouse, and came out with a jackpot. The built in bottle dividers also meant we could easily pack glassware without worrying about jamming too many into one box on top of one another. This also reminded me of my freshman year of college: my family owned a bar so most of my moving boxes were of the Captain Morgan variety. My roommate saw my boxes before she met me for the first time and she later told me she thought I was going to be some raging party girl! Since we don't plan to be in this current place for longer than a few months, and we actually own enough stuff for a 3 bedroom, we are planning on keeping most stuff packed up. Therefore, packing became a bit more strategic. Sure, it is easy to keep a box of DVDs or books closed up in the closet, but what about when we need that one spatula or I can't remember what box I put the mouse to the laptop in (actually the exact situation I am facing right now). The kitchen was divided up into "keep packed" and "use." Most of the keep packed items include our entertaining stuff - our new place would be more than tight if we tried to have a party. Come to think of it - we don't even have a table to host a dinner part at! We rented a storage unit for things like the outdoor table and chairs, our grill, bins of holiday decor, our dining table and chairs, my desk and an assortment of other boxes and baubles we won't need on an every day basis. Much like packing up the car, filling up the storage unit was a bit like playing the game of Tetris. Considerations like keeping out 1 set of mixing bowls instead of all three sets also helped us save room in our significantly downsized kitchen. It also begs the question why we have three sets of mixing bowls to begin with! Of course, as I prepare to make some baked goods this afternoon I am hoping that I did not overestimate how little I would use the kitchen this summer as we might end up having dug through every box by the time we move out of here regardless of the efforts! More to come on this big move that will lead to an even bigger move! For now, I will just have to say goodbye to the Uptown condo that had been very good to us the last two years!